David Gilmour's fourth solo album Rattle That Lock (2015) was initially followed by a short European tour that didn't contain any dates in The Netherlands or Belgium. Luckily, after a North and South American leg, a second European leg of the tour was announced. Of all places, this leg concluded with two shows on the marketsquare of the small Belgian city of Tienen. I attended the second show, the last date of the tour on the European mainland. 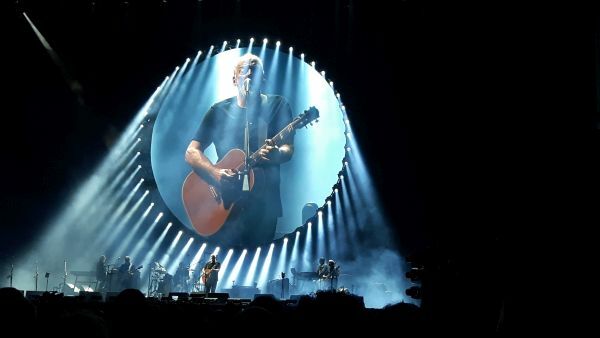 David Gilmour and his band finally entered the stage and opened with three tracks from Rattle That Lock: the moody instrumental 5 A.M., the upbeat title track Rattle That Lock and Faces Of Stone. In the beginning, the sound volume was a little too low, but this improved quickly. The sound quality and mix were excellent during the entire show, exposing every detail of David's monumental guitar play and of the performances of his top class musicians. These musicians were among others Pink Floyd alumnus Guy Pratt on bass, Greg Phillinganes on keyboards (known for his work with Toto) and Steve DiStanislao on drums. 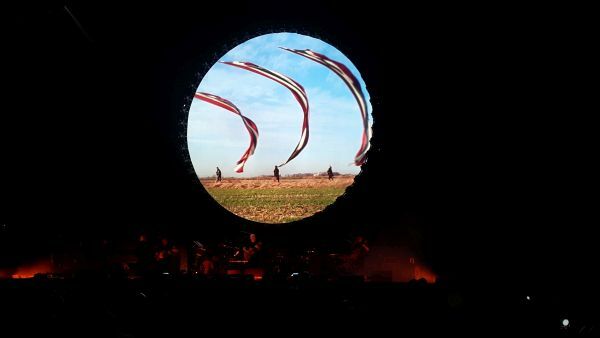 Eye catcher of the stage was the huge round screen, that was sometimes part of the light show and at other times showed the band members in close-up as well as video clips. The first Pink Floyd song was What Do You Want From Me, but this was easily overshadowed by the next one The Great Gig In The Sky. The vocal melody was sung by the three backing singers, partly in close harmony and partly in solos, with great passion and accuracy. David accepted a place in the background, playing pedal steel guitar. The first real highlight and the first of a long string of Pink Floyd classics to be played in between David's recent solo work. The next song, A Boat Lies Waiting, was dedicated to the late Richard Wright. With almost the entire band singing, this was also an impressive and moving moment. After performances of Wish You Were Here (with great guitar interplay of David Gilmour and Chester Kamen) and Money (with a killer saxophone solo by the young and talented João Mello), the first set concluded with High Hopes. The video projection contributed to the melancholic atmosphere of this song, making it another highlight. The intermission lasted merely 10 minutes, before David Gilmour grabbed everybody's attention with a rousing version of Astronomy Domine. A great piece of Pink Floyd history and one of my favourites (on the previous evening, One Of These Days was played instead). Next up was one of the greatest pieces of music ever written, Shine On You Crazy Diamond. The splendid performance of this classic was once again enhanced by video projections. João Mello nailed the solo with the crazy switch from baritone to tenor saxophone. The next part of the set dragged a bit. Although there were powerful versions of Fat Old Sun and On An Island, this part of the show featured some weaker songs (for example The Girl In The Yellow Dress) and perhaps one or two guitar solos too many. This also turned out to be the longest show of the tour so far, with Dancing Right In Front Of Me added as an extra song; in itself a great privilege. Things were back on track with Sorrow and Run Like Hell. All band members wore sunglasses in the latter and with a great light show this was a perfect end to the main set. The band returned with a performance of Time / Breath (Reprise). By now, the sound was almost deafening. Rain fell down, but this didn't prevent the 10.000 people from having the best party. 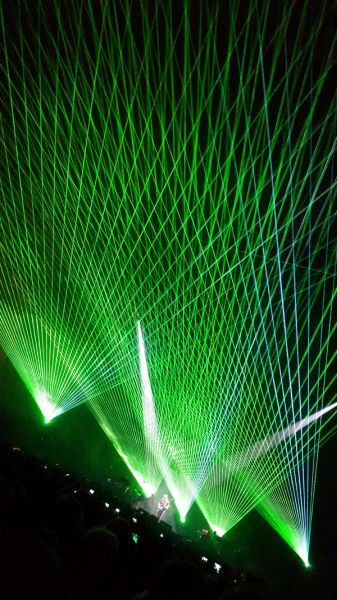 During the last song, Comfortably Numb, the audience was once more surprised when laser beams floated over the entire marketsquare. Breathtaking. Just as the concert itself seemed to go on forever, the last guitar solo also never seemed to end. Eventually it did of course, bringing the 2:45 hour show to an end. This was a world class concert and a night to remember forever. 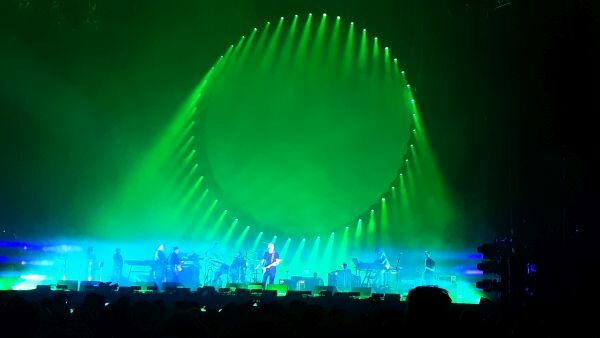 This may well turn out to be the last time David Gilmour performed nearby and I am very happy I took this opportunity.